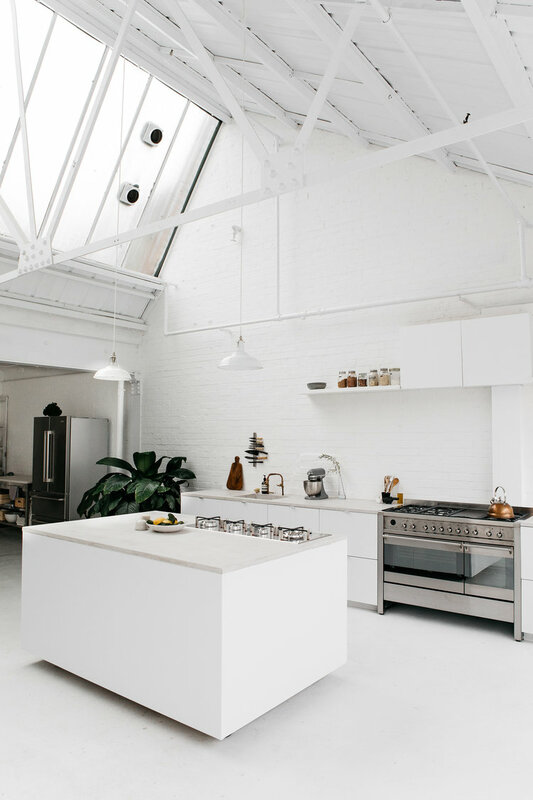 I’ve always loved white kitchens. If I was a Property Developer or an Architect (my preferred choice) and I had plenty of houses to renovate, I would have fun trying different things. 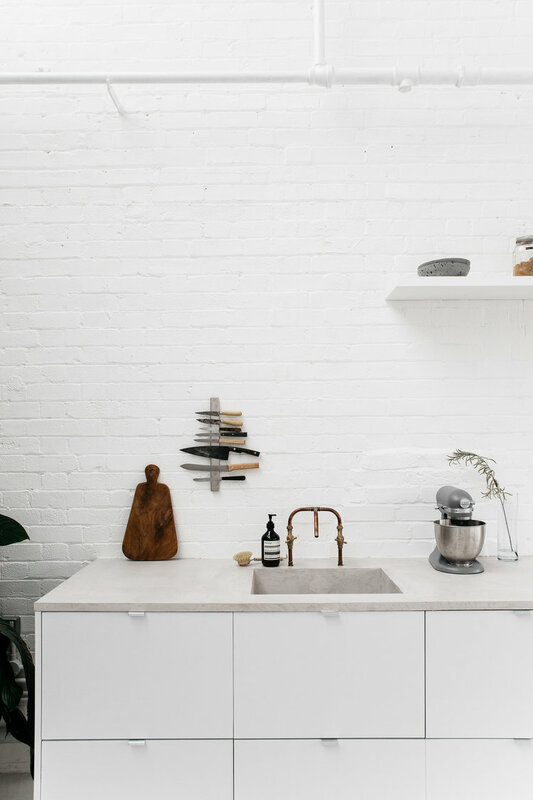 Maybe I will start by fitting a plywood kitchen or a gorgeous grey kitchen or even attempting to fit one with pale green units like this one in a beautiful Swedish flat. 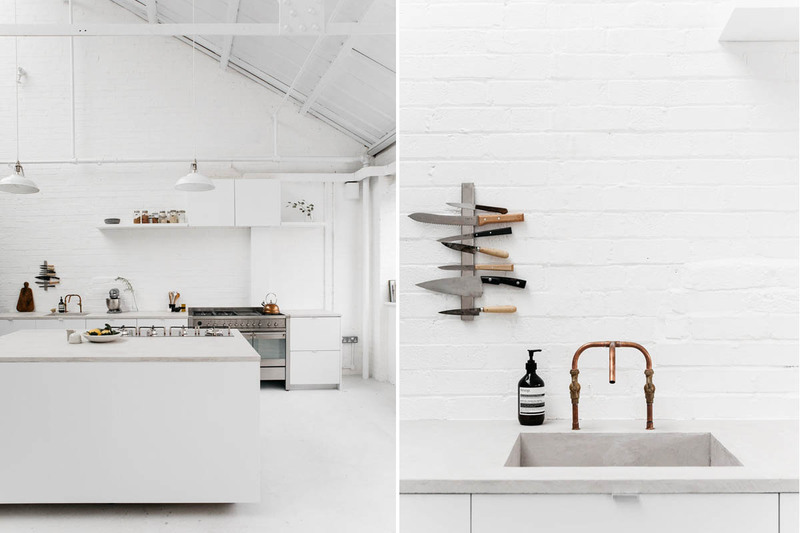 However, when it comes to living with it day in day out, a white kitchen will always be my first choice. How about you!? 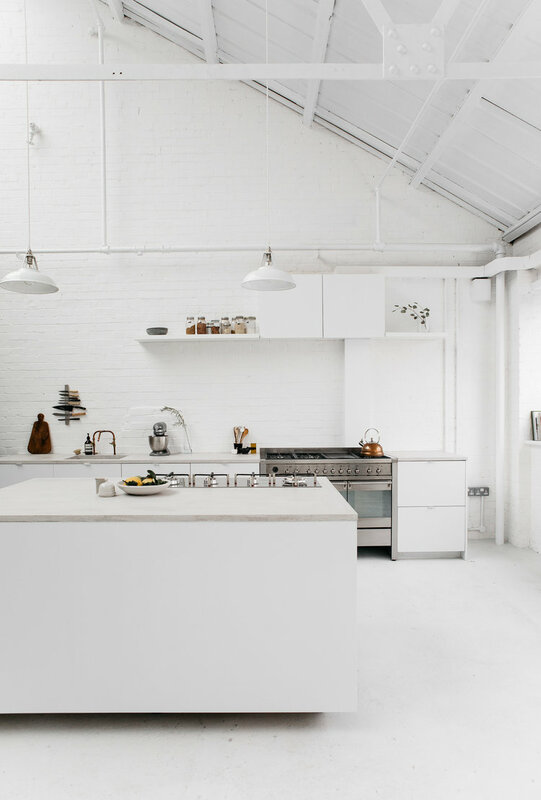 The high ceiling of this kitchen reminds me of this white, airy kitchen designed by Arrhov Frick, the duo of Architects who converted a former meat factory into a block of 22 apartments. 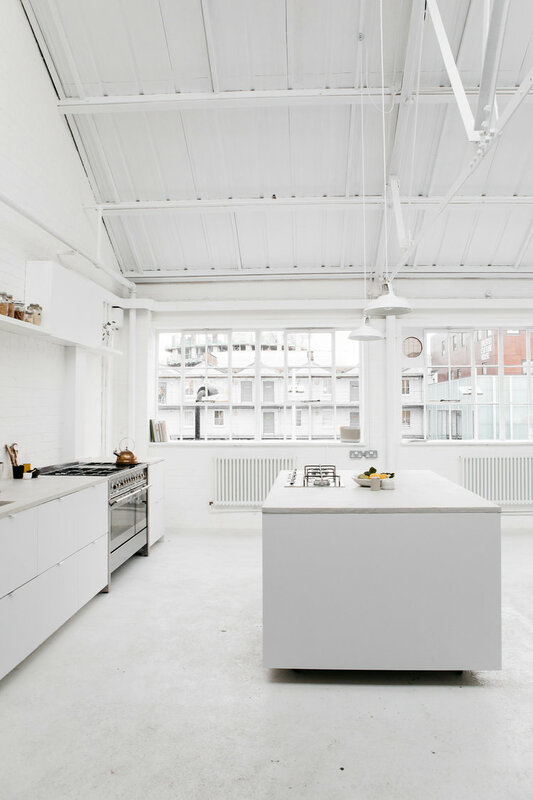 The one below is from Rye London, a daylight kitchen photography studio in East London. 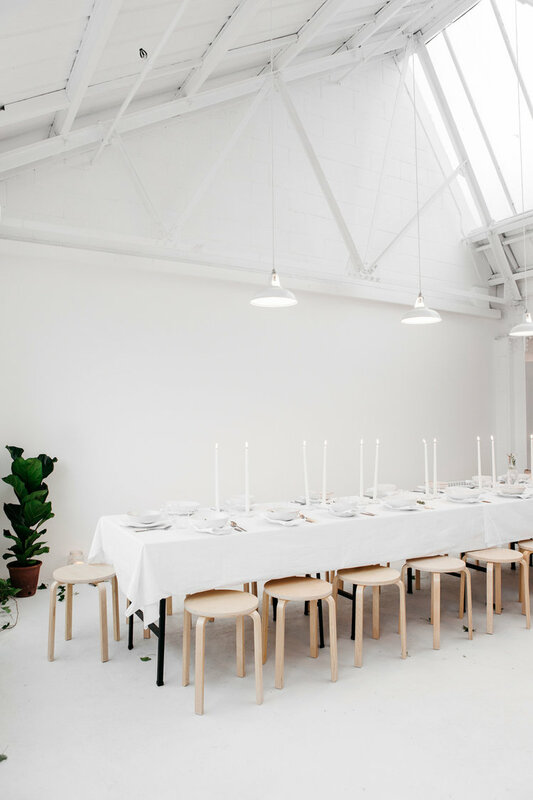 You can also rent the space for events and workshops. I always think it’s tricky to find good, natural-lit, airy venues for an event so it’s definitively one cool address to bookmark. 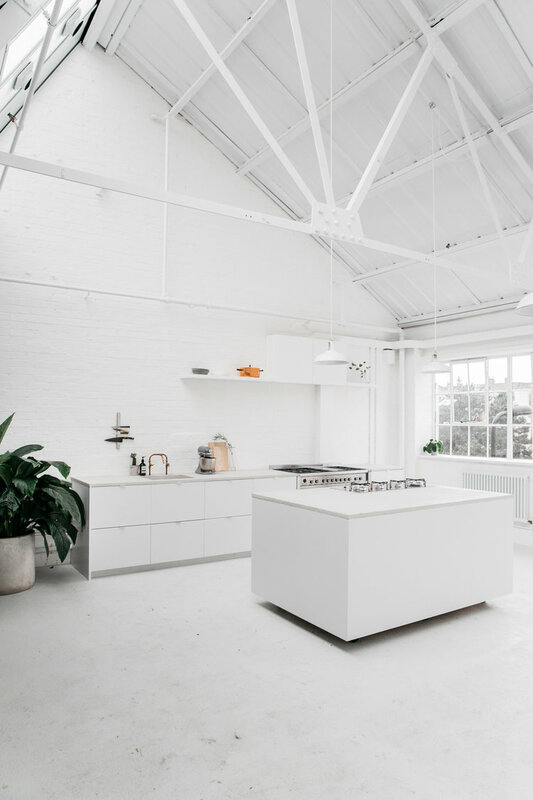 This SMEG dual fuel range cooker adds a striking industrial touch in all white kitchen. 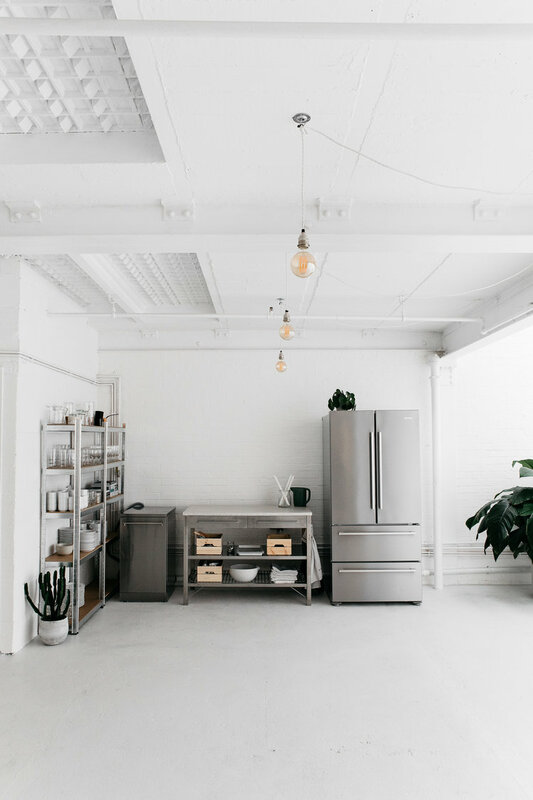 Without getting into performances, A+ rating etc, which I know little about for now, when it comes to making your kitchen look good, the SMEG stainless-steel appliances collection is definitively one of my favourites. They have a distinctive aesthetic design and timeless appeal. The first classic collection was developed in conjunction with the architect Guido Canali (watch the interview). He developed the now famous Canali control knob which you probably know without being aware of its name or Designer. Its design is now so inherent to the SMEG brand that it makes a SMEG appliance instantly recognizable…the epitome of modern classic design. You can find similar stainless-steel range cookers from SMEG and other brands at John Lewis. The stainless-steel fridge is also from the SMEG collection. This specific model is the 4-door American style fridge freezer (A+ energy rating) if you are in the market for a new fridge. 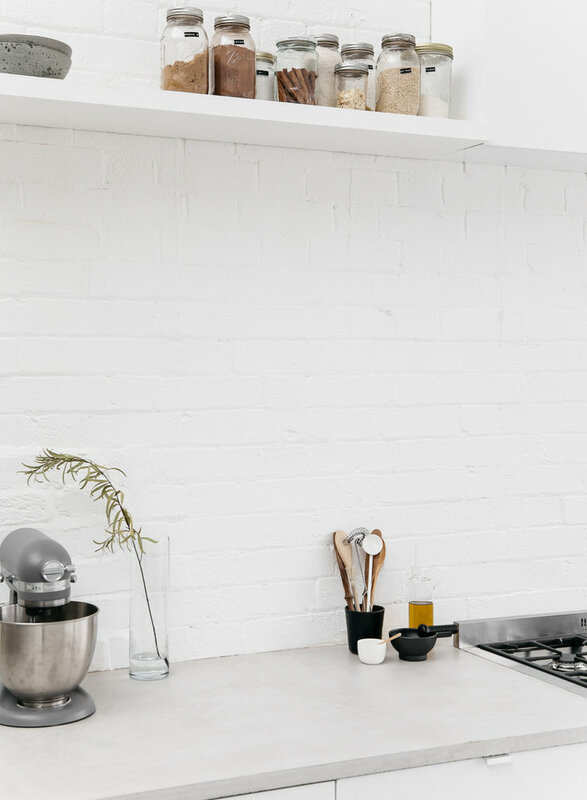 Smeg is one of the rare brands to make beautiful, minimalist stainless-steel dishwashers where the digital control menu is on the edge and not the front of the appliance. The one featured below is the integrated stainless-steel dishwasher, which you can also order online from John Lewis. In our home in London, we have this fridge from Fisher & Paykel (NZ brand) which is very similar and that I highly recommend. 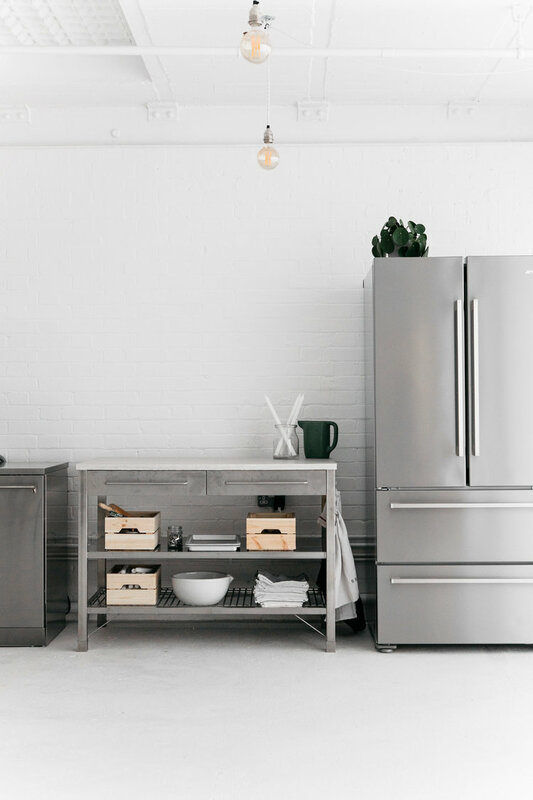 I would have loved to get a stainless-steel American fridge from SMEG but if Steve can support a New-Zealand brand he will do it… so at home, we drink New-Zealand wine, work with New-Zealander tradesmen and have an NZ fridge. It’s a reliable brand, has a beautiful, simple design and most importantly, large and deep drawers. Once you’ve experienced deep pull-out freezer and can see everything you have in the freezer at a glance, it’s difficult to come back to traditional freezers where you often have to take everything out to see what’s at the back. I really love the simplicity and feeling of peace that emanates from this space, don’t you!? Have you spotted the KitchenAid Artisan mixer on the worktop? I would love getting my hands on one of those but I’m also lusting after a Thermomix which a few of my friends have and they all rave about it. The former costs an arm, the latter two and to be honest, I’m not spending enough time in the kitchen to justify the cost of either at the moment. Thank you very much for sharing. I look forward to returning often. It’s so bright and open, I absolutely like it! The appliances work perfectly with the industrial style, bravo for the choice. 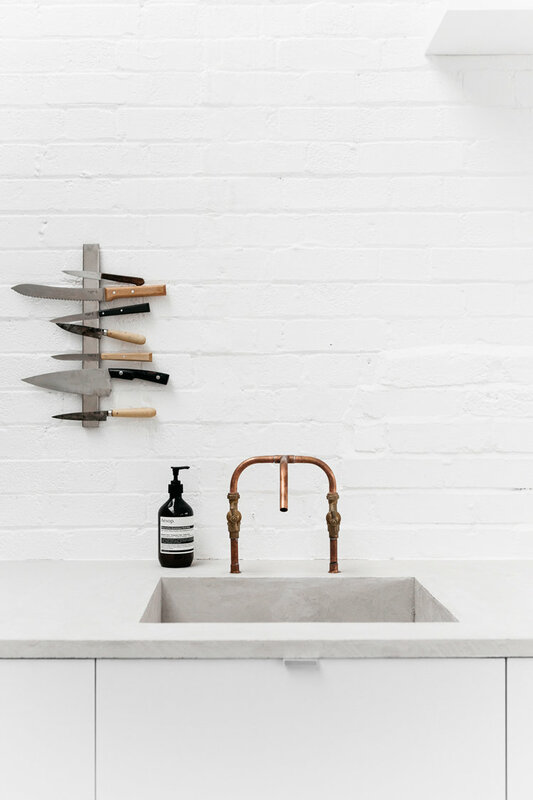 Hi – a question about the work tops and sink area – what material are these made from? They look similar to Tadelakt.